Our second coop came in the form of an old children's playhouse. We had it placed where I had planted an herb garden (which had been moved for the first coop!). We insulated the ceilings and walls, installed vinyl flooring on the aging porch, and enclosed the porch in hardware cloth. We added a mesh-covered run which we painted to match the playhouse, moved the herb garden picket fence to the front of the playhouse, and voila! 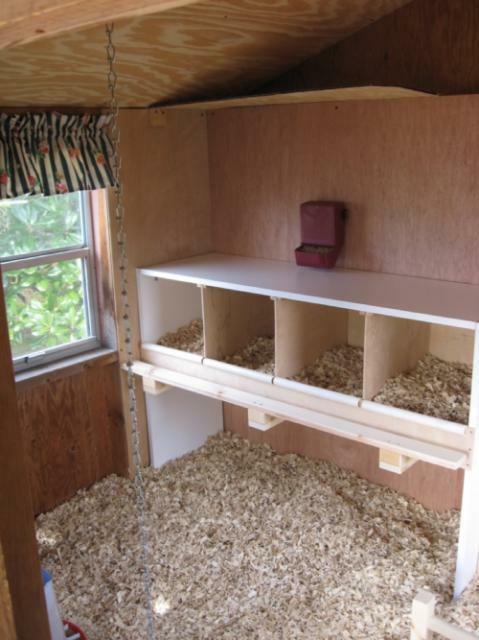 We had a nice place for my bantam hens to enjoy. I can watch them from my kitchen window while I have coffee in the morning. 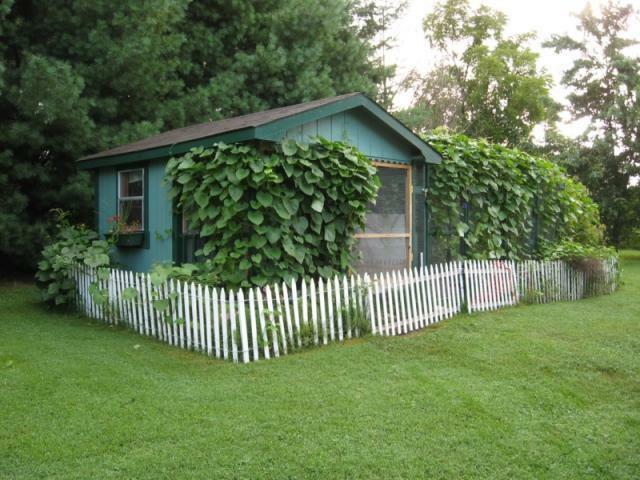 Playhouse run with fennel, morning glories and new grape vines. We also planted thornless blackberries along the back side of the pen. 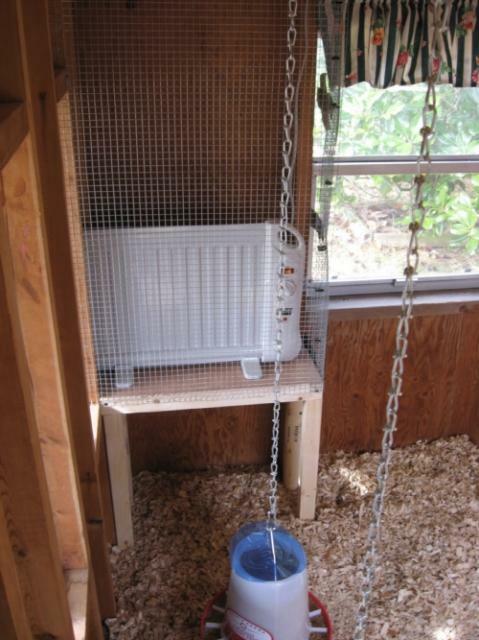 We installed a cage on a secure platform for a sealed-oil heater to keep the coop warm in winter. We later replaced the small heater with a larger one, and we have been very happy with the results. I monitor the temps with a remote thermostat, and we also have a coop cam for security. 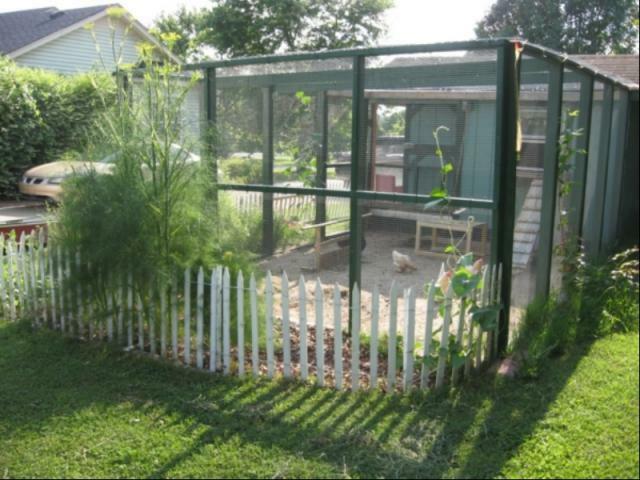 All external coop and run doors were installed with keyed locks, since this coop is outside the fenced portion of our back yard. We also later installed hardware cloth over window openings. Ventilation is provided by the wonderful front porch and split barn door, the two windows, and three ceiling vents we installed - - two on the porch side (south) and one on the back (north). The north side is flanked by a tight row of white pine trees which act as a windbreak. * Cover the run with polycarbonate sheeting. I just hate mucky pens when it rains, and since this pen holds silkies and bantam cochins, I would just rather keep all these birds clean and dry.